As I promised, I have another 6 of the new – maybe a classic one day – headstock designs. Another 6 designs that weren’t used by the company in Singapore who asked me to design them a headstock for a new range of guitars, coming out later this year. Just like last time I think some of these designs have merit and would look respectable if not pretty cool paired with many a shape of guitar body. A lot of these headstocks have piercings because my client really liked GDR8 (sorry, not on the Guitar Design Reviews pages until after manufacture and production) which had a piercing. 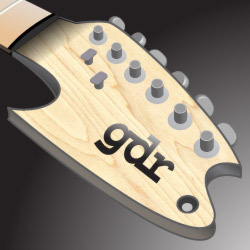 Above you can see GDR9, it’s basically an inverted version of the previous GDR6, which is a coincidence, because 9 is like an inverted 6 🙂 I like this shape of headstock much better than using a projectile shape for a guitar body, just for practicality, guitar bodies need to be able to rest on your knee IMHO. With GDR10 and 11 I was playing with the idea of a paddle. GDR11 is very sturdy and paddle like, but has a little bit of flair in the mirrored concave corners. Not my favourite designs but I was trying things out with the paddle shape just to see what happened. Hey a maple headstock! Yes, GDR12 is, in the illustration, a maple wood design, because I adapted it from the 6 on one side strat headstock I illustrated earlier. This is still using the ‘S’ shapes for the client, but I made this design thinking about the air intake/nose styling on the North American F-86 Sabre, as used in Vietnam! Also a bit of the Japanese variant model; the JASDF F-86D. Yes, fighter jets are cool so I thought it was a good design cue. Also GDR 12 has a straight string path, which some people will like. A lot of wood there, some people like this weight in the headstock. Of course it could be tweaked a bit to be less ‘different’. You know it, GDR13 and 14 also have the S in their shapes. Well guys, I worked in advertising and branding for years, so I know how to work a shape/logo and style into lots of variations within various design constraints. GDR13 is my headstockification of the Ying-Yang symbol! Can you see it? I just think the fretboard side lower curve is a bit steep/sharp, but I haven’t worked it any more because it’s a rejected design. Shame. Finally GDR14 is playing with symmetry and the S again. I like this shape a lot and could probably massage it into a straight string path design if anyone wanted it thus. Also without the piercing the lower curve could be shifted away from the fretboard a bit more. Headstock GDR12 coming at ya! That’s it for now. However I do have some more headstock designs illustrated. All the ones here and in the previous headstock designs post were, as I said before, rejected for a design contract. They had a specific brief which included the “S” shapes within a lot of them. The other headstock designs I’ve got are, many of them, a bit less serious and more playful. You might call them more gimmicky, or more stupid! Anyway, come back in a few weeks and one or two of them should be up here. Next I’m going to do some more reviews and also post a couple of great guitar body designs I’ve illustrated. 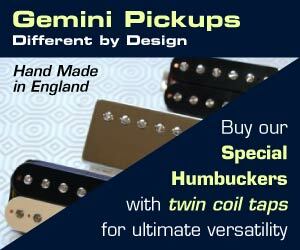 I’ve got 3 guitar body designs up on Guitar Design Reviews right now, you can find the Trinity guitar and Duality guitar bodies here and the Harley Earl guitar here. Headstocks are really tough, when you think about ’em, they have to be functional and attempt to complement the body motif they’re paired with…and each one and every one in the history of guitar design pretty much fits in a box about 4×9″ MAX. So paring attractive NEW ones out of those parameters is actually harder than designing new bodies, in my book. In addition to trying to achieve straight string pull/nut slot binding issues, (as well as introducing strange frequencies through tangential loading), avoiding being too light or too heavy, most want them to be conducive to hanging on a wall-hanger as well, because that’s usually how they’re displayed for sale, so that’s something several of these might benefit from looking at in retrospect. I occasionally break that rule myself, but you’d better have a very good reason. One other Very Important issue is that the tip of the HS is the one area of a guitar MOST likely to take impacts in use, so examples 10, 13 and 14 would probably cause many builders and buyers to be very skeptical, they’re just asking to have those points broken off. Which is not only damaging to the instrument, and its eventual resale value, but the bonehead who broke it off is going to blame you, the designer, for whatever dumb thing he did to bust it in the first place. Once your company’s guitars get a rep for needing repairs like that, it can bode poorly for their future. Headstocks are tough indeed, but being sooooooooo sick of seeing clones, slightly altered and tribute style headstocks by nearly every guitar company drove me a bit mad, frankly! Wait ’til you see the crazier style headstocks I have in rough at the moment. So far that’s all the sensible ones, bar two. Great point about the wall hangers! I have 3 guitars, 2 are on the wall. I think the Hercules I have could handle all of the shapes but 13 and 14 would have to be careful being removed from the wall in their current unmodified designs. Breakages – Yes, things can always get broken though, people still like Parker Fly, thin fragile looking thing that it is, and the 80’s pointy efforts too.